The Jays have a day off before hosting another AL East foe, the Tampa Bay Rays, on Earth Day. The base-running gaffe by Arencibia (1-for-3) is only the latest miscue on the bases for John Farrell’s team. The Jays also got another poor effort from Brett Cecil (1-2, 6.86 ERA). They desperately need him to turn in stronger performances, given that their fifth-starter spot figures to be shaky to woeful for most of the year. 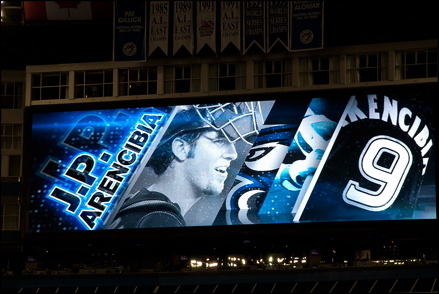 *The Daily J.P. Arencibia to Cooperstown Watch predicts the Miami-born Blue Jay will be elected to the Baseball Hall of Fame in 2033, after a 17-plus-year career spent entirely in Toronto, except for a brief stint with his hometown Florida Marlins that goes awry when he realizes the benefit of the American League’s DH rule for guys like him and the value of the Canadian dollar that will be worth twice as much as the greenback by the quarter-century mark. He belts 440 home runs, evoking Toronto’s latitude (44 degrees north) and tops the homer record for a catcher by roughly 50. He also becomes the first Toronto celebrity to have an entire sorority house at U of T named after him for reasons we will leave to your imagination and captures three MVP awards, two World Series rings and the hearts of more than a few aging Justin Bieber fans, and inspires a good number of fantasy baseball geeks that it’s okay to have a crush on a guy.